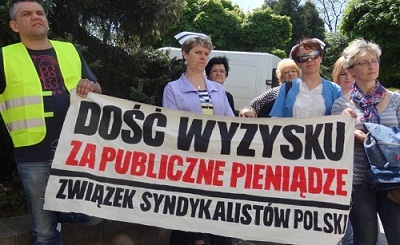 Members of ZSP and the Union of Psychiatric and Addiction Workers at the SPZOZ Hospital in Bielsko-Biala have called off a planned strike after receiving a 200 zl. (45 euro) a month raise. However, the workers still are in conflict with the hospital and do not exclude the possibility of strike action next year. Workers have been demanding a higher wage increase, even if this increase should be introduced in stages. Moreover, only part of their other postulates were fulfilled. The hospital received 21 demands in total, most having to do with health and safety of the workers and patients in the facility. Comrades have also complained about the methods of dealing with the workers on the part of the hospital administration. Partially they feel that the director of the hospital is trying to divide workers by treating different professions separately. The strategy of our union has always been to unite all professions in the same workplace whereas almost all health care unions in Poland are divided by profession.